﻿﻿Familiar animals serve as the models for rock art at Hueco Tanks. ﻿Hueco Tanks State Park and Historic Site in northeastern El Paso County boasts a world-class collection of rock art — ancient images either pecked or painted on stone. Many of the depictions are quite abstract: mask representations, rain altars and Tlaloc- and Quetzalcoatl-like figures representing meso-American deities. Park visitors may feel challenged to find a personal connection with such conceptual likenesses as these. Then there are the animal motifs. Who cannot identify with birds, mammals and insects? Several species that we still see today were painted on the park’s stone outcrops some 600 to 1,400 years ago by the Jornada Mogollon people. By observing carefully and responsibly, we can transcend time and culture to share the experience of wildlife observation with our prehistoric brethren, captured as “still life in stone.” Here are a few creatures depicted at Hueco Tanks that you may find quite familiar. Popularized by the famous Warner Bros. cartoon, the greater roadrunner is easily recognized by its large size, distinctive shape (including a head crest) and stealthy posture. When danger lurks, this desert denizen flies for short distances low to the ground, unable to keep its ample body aloft for long. The roadrunner more typically walks or runs when in search of its favorite prey: reptiles. Using its wings like a matador’s cape, it catches lizards and snakes by the tail with lightning speed and precision before beating the prey’s head against the ground to kill it. Were the Jornada Mogollon people who created this pictograph as intrigued by the bird’s antics as we are today? 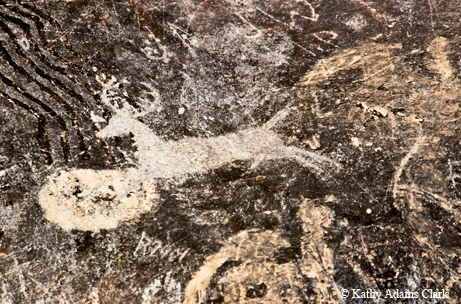 ﻿By seeking out animal-themed rock art at Hueco Tanks, visitors can share the wildlife observations of ancient artists. Deer would have been an important source of protein for the prehistoric dwellers at Hueco Tanks and are pictured in numerous places. Two species of deer inhabit far West Texas: mule deer and white-tailed deer. Mule deer sport bigger bodies than their white-tailed cousins along with larger ears, narrower tails and bifurcated antlers that fork instead of branching as tines from a main beam. Dragonflies are intrinsically tied to water — both literally and symbolically. Adult females lay eggs in water, an event that is depicted at Hueco Tanks. Native American groups and other cultures throughout the world regard the dragonfly as symbolic of moisture. To the Navajo, for example, this insect represents pure water, a scarce and treasured resource in desert lands. Dragonfly motifs are also common in Zuni pottery and Hopi rock art. How fitting that the dragonfly has been immortalized at Hueco Tanks as well. Unique characteristics of the rock outcroppings at Hueco Tanks trap and hold water; hueco is actually a Spanish word meaning hollow or depression. The site has long provided a life-giving water source in an otherwise arid region. Much more rock art can be viewed at Hueco Tanks. Call (915) 857-1135 or visit www.tpwd.state.tx.us/huecotanks for more information and to inquire about guided tours.